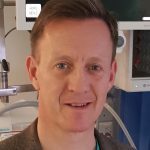 Dr Roddy O’Donnell is a paediatrician mainly working in paediatric intensive care and respiratory medicine. 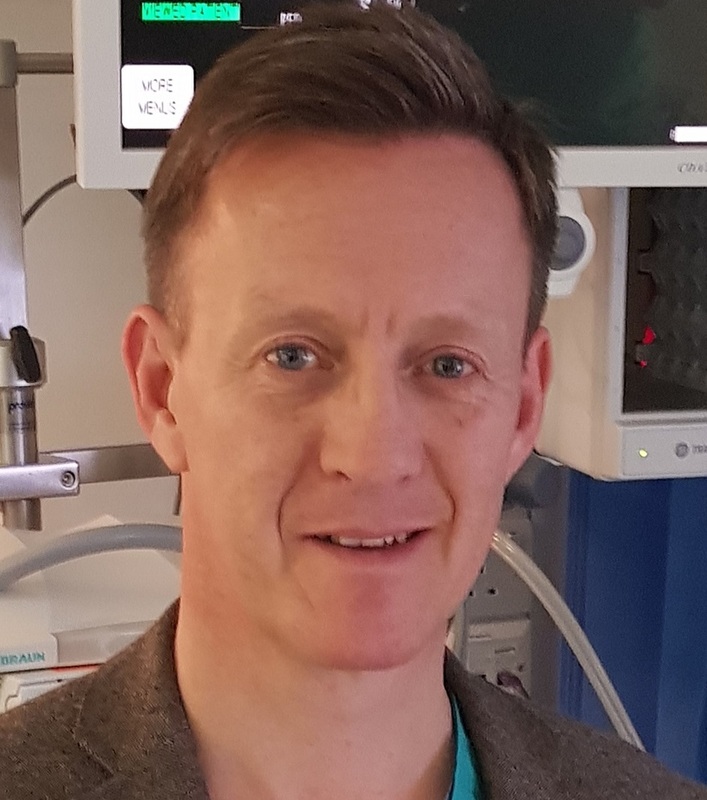 He qualified at St Thomas Hospital (UMDS) London in 1989 and trained in paediatrics in London, Cincinnati, Bristol and elsewhere before coming to Cambridge as a consultant in 2001. After a Ph.D. at Imperial College from 1993 to 1996 and a Wellcome Trust advanced research training fellowship, he undertook post doctoral research in Cincinnati and a clinical fellowship in Paediatric Pulmonology before returning to Imperial College as lecturer in Paediatric Infectious Diseases from 1997 to 1999. He was honorary secretary to the UK Paediatric Intensive Care Society from 2008-11, a member of the clinical advisory group of PICAnet, (since 2002), a founding fellow of the Faculty of Intensive Care Medicine at the RCOA, a member of the UK ATLS Steering Group at the Royal College of Surgeons (2014-2017) and a member of PICU clinical reference group (2013-2016). When an associate lecturer with the Cambridge Clinical School teaching paediatrics since 2003, Dr O’Donnell was asked to help teach Ethics and Law by the late Dr Mark Towriss in 2006 and has been the Associate Speciality Director in Ethics and Law under Dr Fistein since 2010. Dr O’Donnell is also the Director of Studies for Pre-Clinical Medical at Selwyn College where he also supervises Homeostasis (physiology). O’Donnell​, Roddy Child Health Law; in A Medic’s Guide to Essential Legal Matters (editors: Dr Jane Sturgess, Dr Derek Duane and Mrs Rebekah Ley.) 2018 Cht 9. Kua K, Jonas N, O’Donnell R. The larynx and caustic soda ingestion.Arch Dis Child. 2015 Jun;100(6):570. Forbes T, O’Donnell R. Anaphylactoid reaction to facial adder bite. Arch Dis Child. 2011 Sep;96(9):822. Roe MF, Bloxham DM, CowburnAS, O’Donnell DR. Changes in helper lymphocyte chemokine receptor expression and elevation of IP-10 during acute respiratory syncytial virus infection in infants. Pediatr Allergy Immunol. 2011 Mar;22(2):229-34. O’Donnell DR, Parslow RC, Draper ES. Deprivation, ethnicity and prematurity in infant respiratory failure in PICU in the UK. Acta Paediatr. 2010 Mar 18. O’Donnell DR. Recognising severe infection: in hoc signo vinces? Arch Dis Child. 2010 Dec;95(12):957-8. Ercole A, Menon DK, O’Donnell DR. Modelling the impact of pandemic influenza A(H1N1) on UK paediatric intensive care demand. Arch Dis Child. 2009 Dec;94(12):962-4. Schwarze J, O’Donnell DR, Rohwedder A, Openshaw PJ. Latency and persistence of respiratory syncytial virus despite T cell immunity. Am J Respir Crit Care Med. 2004 Apr 1;169(7):801-5. Roddy O’Donnell, Robert C. Tasker, and Michael F. E. Roe. SARS: understanding the coronavirus: Apoptosis may explain lymphopenia of SARS. BMJ 327 (7415):620-62b, 2003. Roe M.F.E., O’Donnell, D.R., Tasker, R.C., Respiratory viruses in the intensive care unit Paediatr Respir Rev. 2003 Sep;4(3):166-71. Roe M.F.E., O’Donnell, D.R., Tasker, R.C., Acute laryngotracheobronchitis Paediatr Respir Rev. 2003 Sep;4(3):267, 269. O’Donnell, D.R. ; Carrington,D. Peripheral blood lymphopenia and neutrophilia in children with severe respiratory syncytial virus disease. Pediatr Pulmonol. 2002 Aug;34(2):128-30. O’Donnell, D.R., Milligan, L., and Stark, J.M Induction of CD95 (Fas) and Apoptosis in Respiratory Epithelial Cell Cultures Following Respiratory Syncytial Virus Infection. Virology 1999, April; 257,198-207. Openshaw P.J.M. and O’Donnell, D.R. Asthma and the Common Cold: Can Viruses Imitate Worms? Thorax. 1994; 49: 101-103.